Discussion in 'Vehicles' started by WSVR, Sep 25, 2014. Thank you very much for your update! Can't get enough touring cars! Inside window materials should have a different alpha sorting number than the outside window materials to avoid strange clipping. I found this on the Focus (all inside windows) and the MG (front window), you can see it in the showroom. The Merc grill looks a bit too thick, maybe this could be thinned to look more like the original one. Also applying a texture from a photo may increase the realistic look. In the showroom/spinner the steering wheel from the Merc is placed on the floor (at 0,0,0 I guess). Would be cool if the wheel could be placed in the car (maybe sticked to the steering column or placed laying on the dashboard?). 1) Could you explain the window alpha bit again? We've created two shaders/gmt's for windows (windows=out, windshieldin=in) and the two alphas need to be different, as an outside alpha won't work for inside. 2) Headlight glass are something we're working on, and sometimes are not the same as the window gmt/shader. 3) We're not going to apply a new texture to it, mainly because that's a ton of work and don't feel the merc chrome looks bad. Sizing wise it looks right to us, it's quite a chunky piece. 4) We can fix the steering wheel in the showroom. In 3DSimED for example, you can enter the alpha sorting for each material in the material editing pane (very much at the bottom of the material setup list). If I'm not mistaken you should set 7 for the inside and 8 for the outside window material to solve that. However, in case my description is too generic and you cannot solve it by that, I could have a look again and send you a detailed description of a material setup that works. 2) Yeah, can understand this. Your mod is a big project. Maybe before 1.0 release you find the time to go through all models and apply/copy the same material settings and prepare the textures accordingly. 1) I see, I know the issue. I put the windshieldin.gmt in the gen file and forgot to remove when experimenting. Quick go last night in VR. Super mod ! Think I mentioned it last update but the mirrors don't adjust which is a huge deal for VR. The default position is way out to the sides and unusable. Any chance of updating this? Thanks Matt, we'll look into this for 1.0. I personally don't have VR, but we do have testers that do. Alexandr Meshkov, StrawmanAndy and TheMattyOnline like this. 3) Yes, that could be it. Guess the black grill parts are placed a little more forward so the grill doesn't look that deep in the end. And sorry for the chrome, I'm not the chrome fan but yeah, you did a splendid job on that! Like I said before, I personally love touring cars and I really love yours. If constructive feedback is welcome and helps, I'm glad to give it. Also if any quick 3D or 2D stuff can help, I'm glad to support you that way too! Think worked out the MG issue. Does it happen to any other cars? 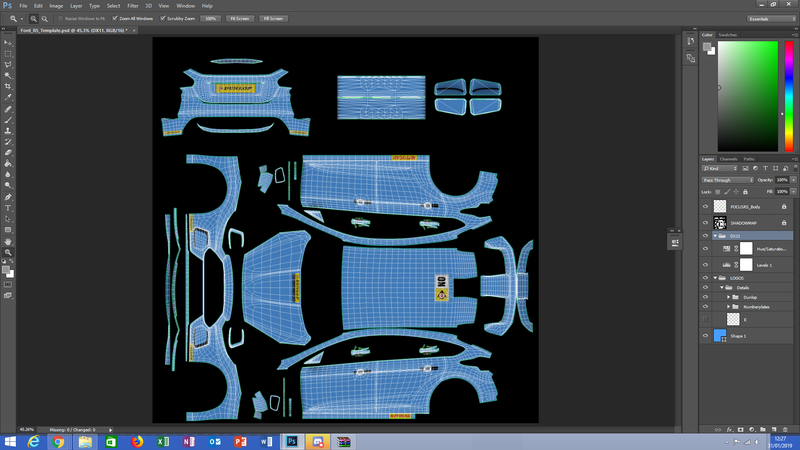 @StrawmanAndy any chance you could take screenshots of the templates opened in PS for me? Would be great if the layers and (if applicable) any layer effects are visible). I opened the templates with the GIMP and think that there are some settings that were not imported. To translate the templates correctly this additional information would be very helpful. Thanks! Yesterday we hit 10,000 subscribers on Steam! Thanks to everyone who has subscribed and helped us, we hope you're all enjoying the cars. We're still working on updates, improvements and also other cars (like the F4 and G40). Be sure to like our page (https://www.facebook.com/nextgenmodteam/) and if anyone would like to donate, feel free by using our "Donate" button on the page. All funds go to the late night coffees and endless sugar we eat. Emery, Slamfunk3, Jack7793 and 11 others like this. PirroC, Hocician and StrawmanAndy like this. Very fun to drive . DrivingFast and johnsclander like this. PirroC and Brack Jabham like this. Test race Friday 1st Practice starts 8pm GMT Quali 8:30 race start 9. Three races each Friday with grids based on finishing order and reverse finishing order to mix things up a bit. can some one tell me where v 1.3 comes from ?